When I was little, my mom would make this casserole/savory bread pudding thing with bread cubes, cheese, eggs and milk. Recently, I’ve been craving it. So naturally I decided to attempt it. Unfortunately, I decided to attempt it without looking at a recipe, or asking my mom. Not always the world’s best choice. Rather than buy ingredients, I decided to use what was in my kitchen. Step one, cube up the left over bread I had (it was drying out anyways – the downside of baking your own bread is that is dries out quickly). 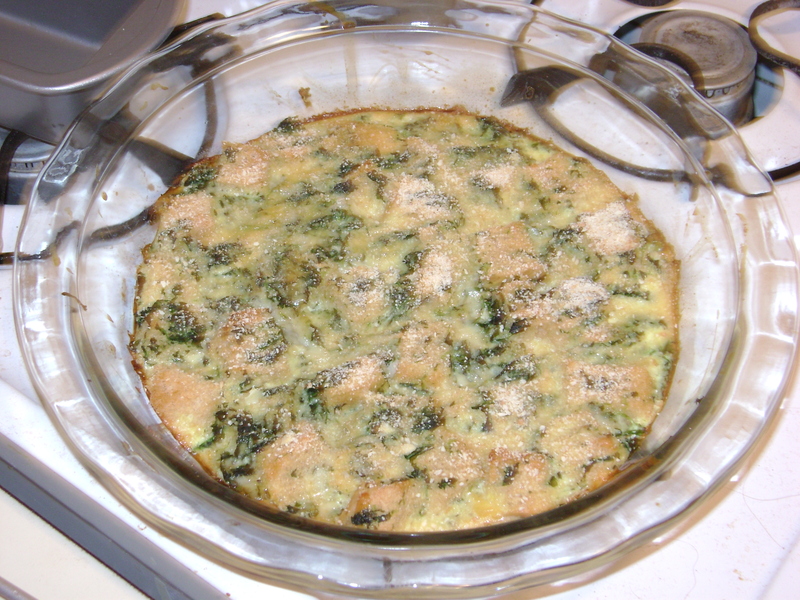 Next, I beat an egg, and added a 1/2 cup milk, some shredded cheese, chopped garlic and some spinach. 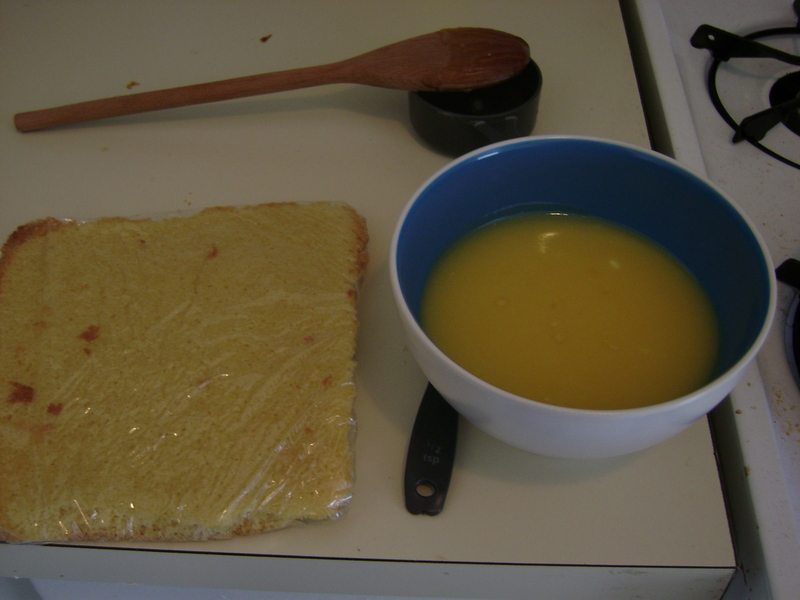 I placed the bread cubes in the pan, and poured the liquid mixture over it. Then I baked it at 350 until it was golden brown and puffy. The result – not bad, but not great. The main problem: too little filling in too large of a pan. Everything spread out and so it didn’t have the texture of bread pudding. The little cubes of bread weren’t totally immersed in the filing. And there definitely wasn’t enough bread. I had a feeling this would happen, but I only have so many baking dishes. Clearly this means I need to shop for more! Yay! The second problem with it was that it was slightly on the bland side. Maybe this dish was always bland and I didn’t notice cause I was a little kid, but this time around it was slightly unfortunate. However, one can always add more cheese – at that fixed that problem. Also, it makes an excellent breakfast – filling, balanced, and works well with a cup of tea. To be honest, I don’t think I’m going to play around with this one more. It was perfectly good, particularly as an odds-and-ends kind of recipes, but there are other things I’d rather do with those ingredients I think, then try to perfect this recipe. Oh well, no one can be a brilliant cook all the time – not even me. But hey, it was still good. I’ve been buying eggplant recently, because it will only be in season for a little while longer, and because I’m determined to master this finicky vegetable. So when searching for something new and interesting in the eggplant department, I came across eggplant croquettes. I love croquettes, but I’ve always been far too intimidated by them to try. They are so soft and I’ve never been certain I could make them in a non-disastrous way. However, I’ve read far too many fantasy novels to be permanently daunted by a difficult undertaking – eggplant croquettes would be made! As per usual this a conglomeration of a couple different recipes: this one and this one. My version: Cut a large eggplant in half lengthwise, drizzle with olive oil, and roast in the oven at 400 until it is soft. Pull it out of the oven and let it cool until it can be handled without hurting yourself. Dice some onion and one or two cloves of garlic. Beat an egg. Mix in the onion and garlic. Scoop out the inside of the eggplant, chop/mash/puree so its not chunky, add to the egg mixture. Add some fresh chopped parsley and parmesan cheese. Now you have the croquette filling. To assemble: Fill a plate or container with bread crumbs. Drop spoonfuls of the eggplant stuff into the bread crumbs. Once the eggplant mix is covered in bread crumbs, fry in olive oil. That is the slightly tricky part, moving the bread crumb-covered eggplant into the frying pan. Patting it into shape a bit, getting more bread crumbs into the eggplant helps it keep its shape. Also, don’t lose your nerve – just grab the croquette and go for it, handling it longer just makes it harder. 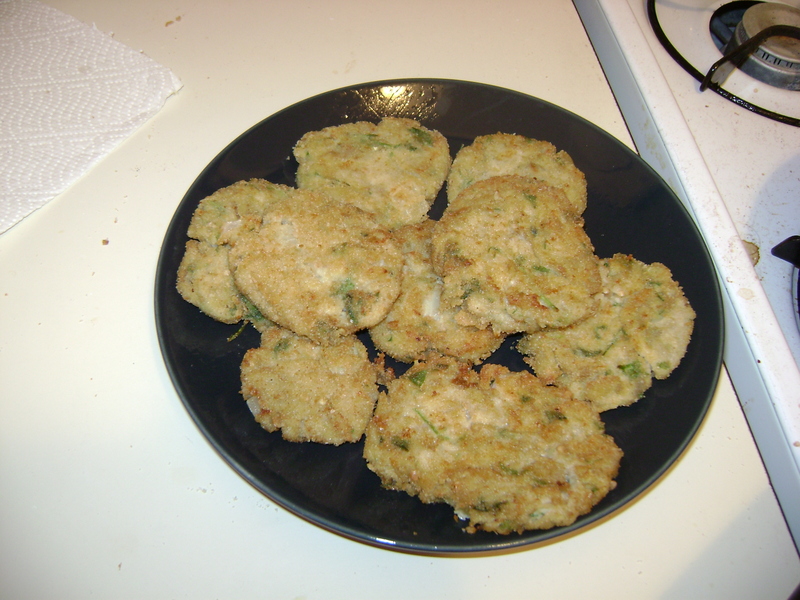 The frying part is less tricky, if one side is browned, it should be fairly easy to flip. Also they are really small, which helps with the flipping. Once done, put the croquette/patties on paper towels to soak up the excess oil. This is very important for all fried foods. The croquettes were a success! I didn’t actually screw any of them up, and they all came out fairly well with no mishaps beyond occasionally getting hot oil on myself (but no new scars or blisters, so its all good). They are delicate, and slightly tricky, but totally doable. As with all fried things, they will lose their crispiness if you reheat them in the microwave the next day, though they will still taste just as good. So … Now that you have all the ingredients, you are ready to make trifle! Most versions of trifle are in giant bowls, and if you want to go that route – awesome. I, however, decided to make little individual servings of trifle. For that I needed little glass bowls. Crate and Barrel to the rescue! I love Crate and Barrel – good kitchen stuff at a reasonable price. They had little glass ice cream bowls, which were perfect. So ready to assemble for reals now. Assembly: Place a piece of the sponge cake on the bottom of the dish. Pour some chambord onto the sponge cake. Other people suggest brushing the cake with the liqueur, but I still haven’t bought a pastry brush. I used between 1/2 and 1 tablespoon. Spoon over some lemon curd. Sprinkle on some raspberries. Add another piece of cake, pour some chambord on it. Add more lemon curd and then more raspberries. I only did two layers, but you can do however many you want. Stick in the fridge until you are ready to eat it. The result was fantastic. Not too much chambord, so it didn’t taste boozy at all. It was very lemony, so you need to like lemons, but it was still a great balance of flavors. I had one of my friends come over to try it, and he loved it too (and volunteered to be a part of any other future dessert experiments). So, a slightly involved process, but as with so many things, you get what you put in. The lemon curd made the dish I think. While this method takes a while, it is well worth the effort. If you take shortcuts, it will probably taste like you took shortcuts, and be far less yummy. On a final note, I still had lots of leftover lemon curd, and that may happen to you. You can stick it on cake instead of frosting or, my favorite, spread it on toast with butter in the morning. So good. This is a long enough saga, I feel it needs to be broken into 2 parts. Several weeks ago, I was flipping through my Harry Potter cookbook, and I came across a trifle recipe. It looked interesting, and one of my friends had mentioned her grandmother had made trifle with sherry and it was excellent. A week or so goes by, and I see a different recipe, this one in my Flour cookbook, for Lemon-Raspberry cake. It looked good, but I lacked cake-pans. 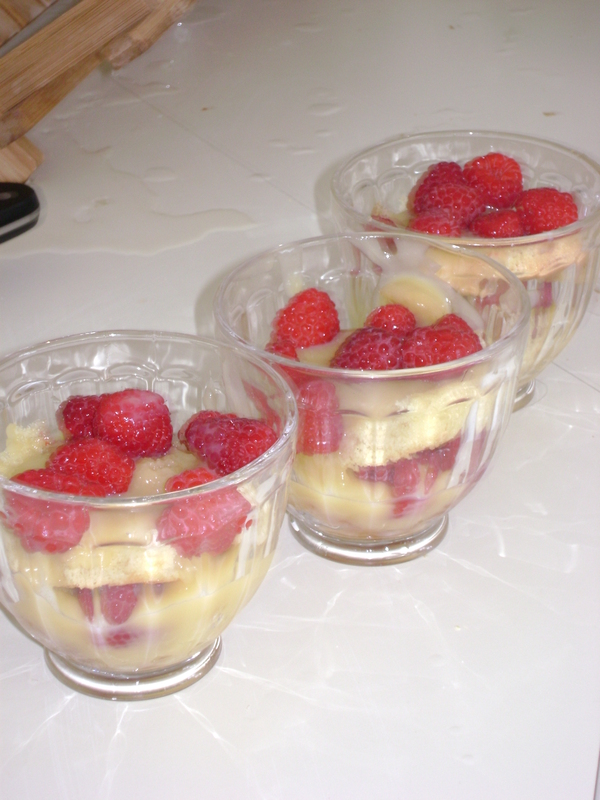 Suddenly inspiration struck – Lemon-Raspberry Trifle! It was perfect. I wasn’t going to buy sherry, but I had chambord, a raspberry liqueur. This weekend, since it was a three day weekend, I decided to put plan into action. Most trifle recipes I found online suggest using store-bought cake, and instant pudding or some such nonsense. Which is clearly absurd. So, I called my mom, figuring she’d have some suggestions, and after some debate, she decided sponge cake would be good (and found her recipe in less than 30 seconds – seriously, she did a countdown). As for sponge cake: beat 1 egg with an electric mixer for five minutes. Yep. Five. Then add in 1/3 cup sugar and mix that in. Add 3 tablespoons of water, and 1/2 tsp of vanilla. Then mix in 1/2 tsp baking powder, 1/4 cup flour, and a pinch of salt. Pour into a pan, and bake at 375 for 12-15 minutes (or until its springy when you touch it). Let it cool. Its kinda sticky, so be careful about wrapping it in plastic wrap – it will stick to the plastic. Rather than use custard, or pudding, something silly like that, I decided to make lemon curd. Again, from scratch. The recipe is adapted from the flour cookbook. beat 2 eggs and 1 egg yolk. Whisk in 1/2 cup sugar. Heat 1/2 cup lemon juice (I used organic, not-from-concentrate juice, but in general one should use fresh), 2 tbsp butter and one tbsp milk in a saucepan to almost boiling. Remove from heat and add a little at a time to the egg mixture. Seriously be careful at this stage. Add a little, and then quickly mix it in. You don’t want the eggs to get unevenly cooked. Once its all mixed in, return the entire mixture to the saucepan, and cook it on medium heat until it gets thick. Add 1/2 tsp of vanilla. Pour into a bowl and set aside.